The Intersections of Assistive Technology, Occupational Therapy, Education, and other random stuff.. Recently I was looking for a tool which would allow me to quickly create a multiple choice series of questions for a student. After scanning the internet a bit I stumbled upon Quizmaker, by Benno Lauther. Quizmaker is an iPad only app. The app is described in German which gave me a little bit of pause as I don't speak German, as was the app support web-site. Because of this, I was not entirely sure it was what I wanted. But, at $1.99 I decided to take the plunge. It was definitely worth it! Quizmaker is intuitive, and fun to use. The graphics are sweet, with vibrant colors. The ability to import photos from your photo album is easy. Using Quizmaker, a series of multiple choice questions can be generated on the fly. Each question has 3 possible answers, and you can create written or audio questions (or both), as well as custom audio responses. Wrong answers can be customized to have a audio response, or no feedback. Creating and editing your content is a breeze. Question sets can be saved to use at a later date, which is a significant plus for educators. What I would like to see is the ability to scan the answers, so my switch users could access this app. Then, we would have a really significant product for such a population. The app developer emailed me this link for English support. Overall, this is a great tool for educators and therapists to use as an alternative writing tool for tests or quizzes. 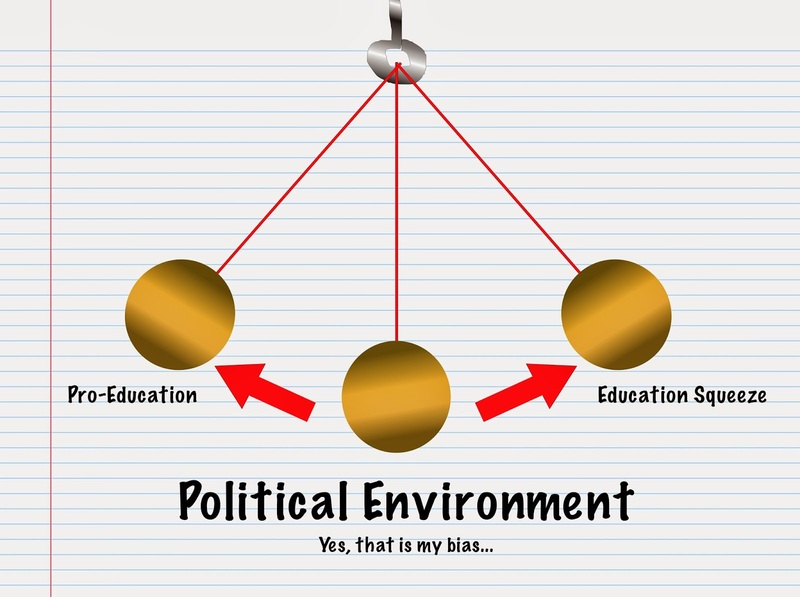 The political climate is often like a pendulum, swinging from one extreme to another. The deconstruction of public education has been swinging for a long time in North Carolina. Could it be beginning to swing back to sanity? IMHO, teaching has been under attack in our great nation for several years now. As a country, we have asked teachers to perform the tasks of teacher, parent, social worker, behavior specialist, english-as-second-language-teacher, and many other tasks beyond the scope of their training. All while decreasing pay and benefits for the same job. North Carolina has been a front runner of such craziness. North Carolina is ranked 46th to 49th (depending on which source you reference) in teacher pay. Remember how many states there are in the US? That's pretty low. It seems disingenuous at best to hear Governor McCrory "lament the state's near-bottom average teacher salary" after the gutting his administration just gave NC teachers (cutting education budget by $285 million, lay-offs, eliminating differential pay for Master's level teachers, etc). The $4,200 pay bump to be doled out over two years to the newest teachers (by some estimates about 24,000 teachers)is a move in the right direction, but may well stick in the craw of veteran teachers (by some estimates about 71,000 teachers) who might resent new teachers making more than they. I don't have any faith in McCrory and his "friends" wanting to repair our education system. I'm of the opinion that they are not interested in doing so. However, what they may be interested in, is if enough North Carolinians continue to be outraged and express their outrage in a variety of forums. That is why he's offered this tiny pay-bump, and with enough pressure may make further changes. So, keep the pressure on folks, speak out, write McCrory, and support your teachers however you can. So, if your like me, you use Facebook. A lot. Maybe with students, maybe for personal use. For me, it's a "love-hate" relationship. Facebook is constantly changing and often for the better, but sometimes, not. One "improvement" is making videos automatically load while your scrolling on your mobile device. This is fine if your on wifi, or have unlimited data. But if not, you may notice your mobile bill going through the roof as your data consumption drastically increases. So, this is fixable, at least on an iDevice. Go into your Settings. Then touch your Facebook. Within Facebook choose Settings right under the Facebook icon. 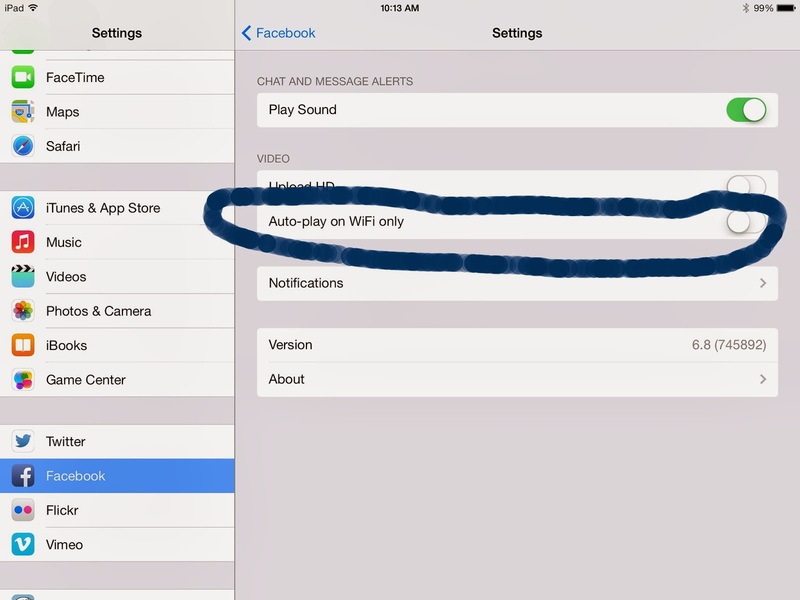 Once in Settings, turn on "Auto-play on WiFi only". This process will help you keep you or your kid's phone bills a bit more manageable. This tip came to me from my buddy and head wrestling coach, DeWitt Driscoll. He's officially a junior Tek-Ninja now! Speaking of wrestling, my posts have been sporadic at best lately, as my wrestling team is competing a lot, and dominating in the process! Great fun, but cutting into my writing time. Just a few more weeks, and the season will end, and I will resume blogging more regularly. I assume the other platforms (Droid, Mobile Windows) offer a similar feature. If any readers can comment on this, other readers would likely appreciate that. Be TechSavy, Follow by Email!